This hotel in Kutaisi city centre features a 24-hour front desk, free Wi-Fi and a restaurant serving Georgian cuisine. Kutaisi Train Station is 5 km away. Rooms at the Hotel Rcheuli Palace feature bright interiors and sleek furnishings. Each room includes a flat-screen TV, work desk and refrigerator. A breakfast buffet is provided in the hotel’s restaurant, which is decorated in warm colours. A chandelier and carpets make for a cosy atmosphere. Hotel Rcheuli Palace is located 10 km from Satapliiski Natural Park and 15 km from Gelatskii Church. Guests can take day trips to the Prometheus Caves, 25 km away. A bus stop can be found 50 metres from the hotel, which offers free private parking on site. The hotel can also arrange shuttle services for a fee. Featuring an indoor pool, free Wi-Fi and a buffet breakfast, this hotel in Kutaisi is 800 metres from the banks of the Rioni River. Karaoke facilities and a restaurant with terrace are also offered. Modern rooms at Hotel Kolkha come complete with a flat-screen TV, a work desk and a seating area. Each one offers parquet floors, a neutral colour scheme and plenty of natural light. Georgian and European cuisine is offered in the spacious restaurant, where guests can also enjoy live music and dance performances. A variety of drinks are offered in the contemporary-style bar with colourful lighting. 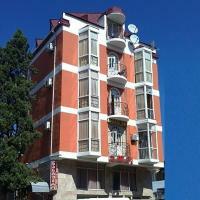 Hotel Kolkha is 500 metres from the Kutaisi Sports Palace, and 3 km from Kutaisi city centre. Located 8 minutes’ drive from Kutaisi Train Station, this hotel is surrounded with greenery and features free Wi-Fi. It offers a library and air-conditioned rooms with satellite TV. All the classically decorated rooms at Imeri Park Hotel include a work desk and a wardrobe. Bathrooms come with slippers and a hairdryer. The Imeri’s restaurant with floor-to-ceiling windows serves Georgian cuisine, which can be enjoyed on the terrace. Barbecue facilities can also be found on site. Guests of Imeri Park Hotel can play billiards or table tennis, and read a book in the on-site library. Fishing and hiking can be organised on request. The UNESCO-listed Gelati Monastery is 20 minutes’ drive from Imeri Park Hotel, and the Bagrati Cathedral is 15 minutes’ drive away. Located 6 minutes’ drive from the UNESCO-listed 11th century Bagrati Cathedral in Kutaisi, this hostel features free Wi-Fi and a shared kitchen. It also offers a terrace and free private parking. Each room at Kutaisi Hostel includes simple décor and wooden furnishings. Guests use shared bathrooms with a shower. Meals can be prepared in the hostel’s kitchen, which also has a dining area. Al fresco dining is available on the terrace. The 12th-century Gelati Monastery is 10 km from Kutaisi Hostel, and Kutaisi Train Station is 8 minutes’ walk away, providing a link to Tbilisi. In the center of the Kutaisi, this hostel features dormitories and private rooms only 820 ft from the Davida Agmashenebeli Square. It has a shared kitchen. Each of the rooms has free Wi-Fi and air conditioning and guests share the 2 bathrooms. Mosquito nets can be requested. 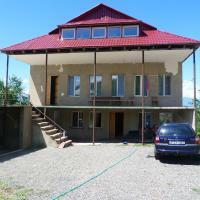 The shared kitchen can be used to prepare meals and local restaurants are situated only 164 ft from the Hostel Kutaisi. Guests can enjoy entertainment at Gabashvili Park or visit the Begrati Cathedral, both just over 1 mile away. The garden of the Hostel Kutaisi contains a children’s playground. Kutaisi Airport is only 7 miles away and the Train Station is just over half a mile from the Hostel Kutaisi. There is a bus stop on Tsereteli Street, just 164 ft away. This hotel is located in Kutaisi city centre. It features free Wi-Fi. Kuraisi Besik Gabashvili Park is 150 metres from the premises. Bagrati Cathedral is 3 minutes’ drive away. Decorated in classic style, rooms at Aeetes Palace Hotel include a TV and armchairs. Private bathrooms are fitted with a shower, bathrobes, slippers and free toiletries. Guests can enjoy Georgian cuisine and wines in the on-site restaurant, or relax with a drink at the bar. Kutaisi Train Station is 2.5 km away. Kutaisi Airport is 4 km away. Batumi International Airport is 145 km from Aeetes Palace Hotel. Located in Kutaisi town centre, 1 km from the 11th-century Bagrati Cathedral, these apartments features a fully equipped kitchen and free Wi-Fi. The UNESCO Heritage Gelati Monastery is 10 minutes’ drive away. Central Apartments Kutaisi are decorated in a classic style and includes a flat-screen TV. DVD player is also provided, and the bathroom is fitted a hairdryer. Guests can cook meals in the kitchen, which comes complete with a fridge and stove. Several bars can be found within a 5-minute walk of the property. Sataplia Nature Reserve with caves is 7 km from Central Apartments Kutaisi, and Tbilisi city is 220 km away. Free Wi-Fi and free private parking are featured at Hualing Hotel, located in the western suburb of Kutaisi town. It is 7 km from Kutaisi centre with the 11th-century Bagrati Cathedral. Air-conditioned rooms at Hualing are decorated in warm brown tones and include a flat-screen TV. Bathrooms are fitted with a shower. A range of Chinese, Georgian and Asian cuisines is served in Hualing's restaurant. The UNESCO Heritage 12th-century Gelati Monastery is 16.5 km from Hualing Hotel, while the E60 motorway providing a link to Tbilisi is 10 minutes' drive away. Tirifi Hotel is located in Kutaisi government district, 15 minutes’ walk away from the Parliament. It features its own small winery and wine cellar. Free Wi-Fi and free private parking are provided. All well-lit rooms come with air conditioning and a flat-screen TV. Free toiletries and slippers are provided in a bathroom. Various cafes, bars and restaurants can be found within a 10-minute walk from the property. Also it is possible to order breakfast in room. Tirifi Hotel offers a sauna and a 24-hour reception. Kutaisi Central Station is 3 km from the hotel, and David the Builder Kutaisi International Airport is 14 km away. Located just opposite the Drama Theatre in Kutaisi historic centre, Edemi Hotel features free Wi-Fi and a 24-hour lounge bar. The UNESCO Heritage 11th-century Bagrati Cathedral is 15 minutes' walk away. All the air-conditioned rooms at Edemi come with a flat-screen TV. A hairdryer is provided in the bathrooms. You can enjoy Georgian cuisine in the on-site restaurant, and local wines are also offered at the lounge bar. The 12th-century Gelati Monastery is 8 km from Edemi Hotel, and Kutaisi Bus and Train Stations are 1.5 km away providing access to Tbilisi City. Located just 5 minutes' walk from the 12th century Gelati Monastery, 8 km from Kutaisi town centre, Quiet Residetial Guest House features free Wi-Fi. You can also use a shared kitchen. All the simple rooms at Quiet Guest House include classic-style layout and a desk. Shared bathrooms come with a shower. You can cook meals by yourself in the shared fully equipped kitchen with a stove and kettle. The UNESCO Heritage listed 11th century Bagrati Cathedral is 9.4 km from Quiet Residetial Guest House. It is 15 minutes' drive from Kutaisi Train Station. 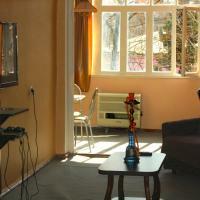 This hostel is located in the centre of Kutaisi, a 20-minute walk from the Bagrati Cathedral. A 24-hour reception is featured at Hostel Ell. The bright rooms offer simple, traditional interiors. The shared bathrooms are in the hallway. Guests can cook their meals in the shared fully equipped kitchen, complete with a dining area. A restaurant serving Georgian and European cuisine can be found within a 7-minute walk of the hostel. The Gelati Monastery is 9 km from Hostel Ell. Kutaisi Train Station is 2 km away, and Kutaisi International Airport is 25 km from the hostel.